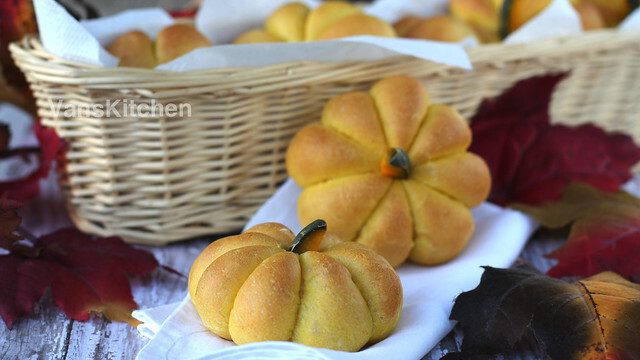 Watch how to make pumpkin buns on Van's Kitchen Youtube. Even though Phoenix does not have 4 seasons in my eyes (no leaves changing colors in the Fall, snow in the winter, or trees budding in the spring), I love to cook with seasonal ingredients. Not only are the prices great, everything seems to taste better when it's in season. 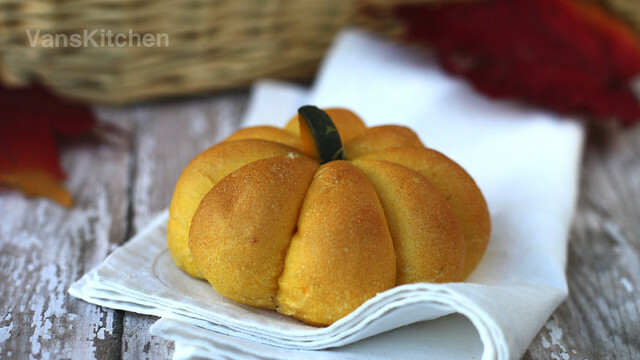 This kabocha pumpkin bun is one of my favorite things to make in the Fall. It's healthy, and a very convenient snack to have along for outdoor activities. It's tasty too! 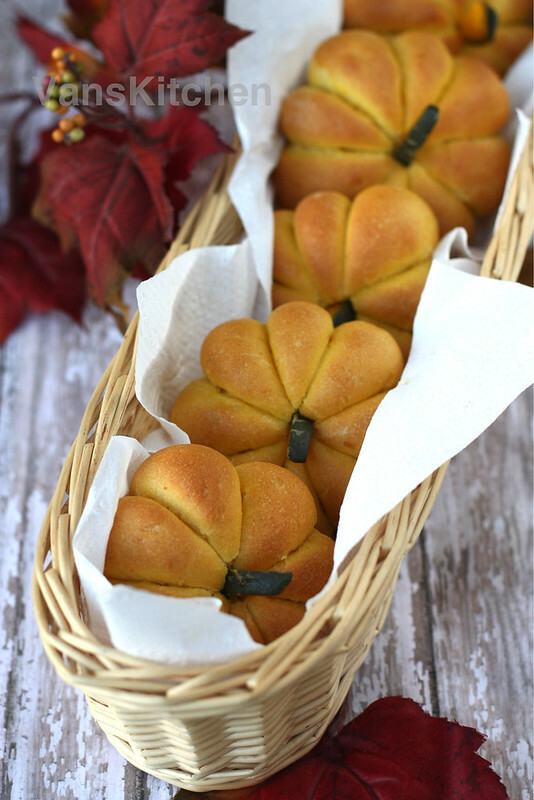 Steam or boil the pumpkin until a toothpick inserted easily. I steamed by a pressure cooker and it took about 6 minutes to steam counting from when the pressure regulator started to rock. Cut out 12 strips to make stems for the pumpkins later. Set aside. Peel off the skin of the remaining pumpkin and transfer into a food processor, grind into a smooth puree. You can use canned pumpkin as a shortcut. Combine all the ingredients and mix until smooth. Then cover, and store in fridge. Heat ⅓ cup water to 105°F~115°F (Do not exceed 115° or the yeast will die). Mix with sugar until dissolved. Sprinkle active dry yeast on the surface of water and sugar mixture in a large mixing bowl (or in the bowl of an electric mixer). Let stand until the yeast is dissolved, about 5 minutes. You will see a froth form on the top of it, and you can also smell the yeast. In a separate bowl, stir together flour and salt. Gradually stir (or mix on low speed with the paddle attachment) flour mixture, pumpkin puree, butter, beaten egg, yeast mixture, and milk. Knead on medium speed with the dough hook for about 5 minutes, or until the dough is smooth and only slightly tacky. It should have a soft, pliable quality, not stiff and resistant. If it is too stiff, knead in small amount of water until it softens; if the dough seems too sticky, sprinkle in small amounts of flour as needed. Kneading yeast dough by hand: On a floured counter, fold the dough over toward you, then press it away from you with the floured heel of your hand, then give it a quarter turn, fold it, and press away again. To test: slowly and gently stretch a small piece of dough, the dough should hole together without tearing until it forms a sheer membrane, thin enough to let light come through. Lightly oil a large bowl and transfer the dough to the bowl, rolling it to coat it with oil. Cover the bowl with plastic wrap. Ferment at room temperature for about 2 hours, or until the dough doubles in size. Punch down the dough for degas, fold the edges of dough to the center. Transfer the dough to the counter and divide into 12 pieces. Flatten, then spread the filling. Seal, then form into a round ball. To make into the shape of a pumpkin. Just use twine, and tie it around as seen in the video. Don't tie too tight, because the dough will rise. Place on the lined baking sheet. Cover loosely with plastic wrap and let rise again, about 20 minutes. Preheat the oven to 350°F (180℃). Bake about 8 minutes. Remove the loaves to a rack. Cool completely, then cut and pull out the twine. Cut the top, and insert the pumpkin strip to make it as a pumpkin stem.